Are Your Employees Using their Vacation Time? A few months ago, I had written a posting in regard to promoting a healthy-work life balance within the workplace. I went over the general idea of why it was important to promote this balance and the negative consequences that can occur if you do not create a culture that encourages that. Part of having that balance is making your employees take time off as needed, whether it is for a sick day or just a mental break to recuperate. Recently, the Director of Public Relations from Compliance and Safety, Matthew Pelletier, had reached out to me. He showed me an interesting infograph that discussed the fact that many American workers don’t take personal and vacation time that they are awarded. 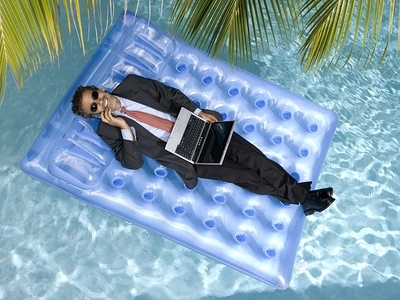 This has sparked today’s blog post: are your employees using their vacation time? Fear for job stability: many employees worry about job stability in the shaky economy. They fear that their employers will see that they really don’t have a need for them. Lack of money: many employees do not have the disposable income they once had and therefore feel like it is a waste to take time off without having the means to actually go anywhere. Backlog issues: employees worry that leaving work for a few days will cause a work backlog that can actually cause them more stress than not taking the vacation at all. Workaholic syndrome: technology has bred many workaholics and have caused workers to always be accessible and working 24/7. Many employees can’t force themselves to unplug enough to enjoy a vacation. It is important for your employees to take time, as they see fit. If they do not have this work/life balance, stress will decrease productivity and happiness; and increase sickness and absenteeism. It is more beneficial to have your employees take time off than to have them work straight through. As managers and leaders, you must set an example for your employees before negative situations occur. Take vacations yourself, promote the importance of taking time off, and encourage them to do so even if it’s a day to relax at home here or there. It will create a positive culture and workforce. Why Aren’t You Taking Your Vacation Time?